Cholera treatment in Zimbabwe (file photo). United Nations agencies on Friday donated more than $3 million towards the fight against cholera, which has killed 54 people mainly in Harare. 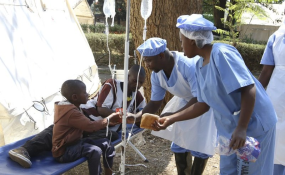 The World Health Organisation poured in $1 004 088 for strengthening response to and management of cholera and other epidemic-prone diseases in Harare, while the United Nations Children's Fund (UNICEF) weighed in with $755 030. UNICEF also donated $1 096 850 for the cholera wash programme. This came as the World Food Programme poured in $230 175 towards in-clinic feeding to cholera patients to contain the outbreak and support recovery. Chairman of the inter-ministerial committee on cholera Cde July Moyo, who is also the Local Government, Public Works and National Housing Minister, received the donation on behalf of Government. Cde Moyo said the overwhelming response received from the corporate world, donor agencies and individuals towards curbing the outbreak was commendable. "Since the onset of the outbreak, the UN family has been at the forefront of supporting Government efforts to contain the outbreak," he said. "This contributed to a significant reduction in cases being received at the various centres in the 23 hotspots identified, with Glen View and Budiriro suburbs being the epicentres of the outbreak. "This fund will ensure immediate rapid scale-up of cholera outbreak response activities, increase access to life-saving treatment, awareness of cholera prevention among the affected and at risk communities, while resource mobilisation efforts continue." Cde Moyo said the fund will facilitate procurement and distribution of essential medicines and supplies for cholera treatment centres to scale up response activities. "The fund will also facilitate provision of safe water, proper sanitation and health education for improved hygiene and safe food handling practices by communities," he said. UN resident coordinator Mr Bishow Parajuli said they will continue working towards supporting the Government in its efforts to come up with a lasting solution to the cholera outbreak. "We are hoping that this immediate response will meet some of the immediate needs," he said. "As the rain season approaches, we have to be really attentive. We are hoping that this support we are bringing will bring a cap to this. "We will continue to work long term in addressing these kinds of issues." Public Service, Labour and Social Welfare Minister Dr Sekai Nzenza expressed heartfelt gratitude to the UN family for the intervention. She said the kind gesture will go a long way in addressing the needs of the communities affected by the cholera outbreak.